For more than three decades, John Sinclair has shared his talent and dedication to musical excellence with the Central Florida community and beyond. 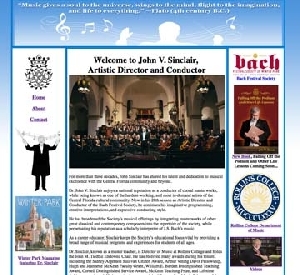 Dr. John V. Sinclair enjoys a national reputation as a conductor of choral masterworks, while being known as one of the hardest-working, and most in-demand artists of the Central Florida cultural community. Now in his 28th season as Artistic Director and Conductor of the Bach Festival Society, he continues his imaginative programming, creative interpretations, and expressive conducting style. He has broadened the Society’s musical offerings by integrating masterworks of other great classical and contemporary composers into the repertoire of the society, while perpetuating his reputation as a scholarly interpreter of J.S. Bach’s music.